You have heard this number of times about how social media has changed the way we do business. Say, it has changed the way customers eat, what they crave and how they choose a place to eat. More than 43% of people dine out more than once a week and nearly 47% of people are influenced in their purchases by social media. 40% of all family, casual and fine dining restaurants are very active on social media. So seeing the survey it is pretty obvious that Social media plays an important role in generating more revenue and targeting more number of people. Below list will help you to generate revenue, make social media part of the dining experience with mechanics of social media post. Regularity: 1 or 2 times a day. Suggestion: Tag all your photos with a custom hashtag and geo-tag your restaurant’s location. Utility: check-ins, promotions, generating customer relationships, customer service. Suggestion: Make sure you have your restaurant’s Facebook page as a “place”. This way your customers can “check-in” when they visit your restaurant. Utility: Promotion, customer service and behind-the-scenes. Regularity: More than 3 times per day. Suggestion:Use Hootsuite, a free social media dashboard app which will schedule your tweets in advance. It’s a saying that if you see anything often then you are bound to think about it once in a day so the same thing applies here. Repetition is a key so posting the same link or image on your social media account is not a bad thing. Try to post the same thing again but in a different way. Be more creative and unique with your content. Every social media platform is different from Instagram for hashtagging, Facebook for more lengthy posts and twitter is best for 140 character quips. Facebook is the most effective way to advertise your restaurant. It allows you to reach new customers in multiple ways. It helps in building brand awareness and generates revenue. Facebook Ads allows you to reach new audiences in various ways. You can pass Ads on Facebook, promote your page and it’s an effective way to drill down and target new customer. Survey says that because of social media people are likely to try new things based on their friends’ suggestions. Brand promotion is very important and that is possible through advertisement. The aim is to ensure that your prospects are getting something in return for their click. Today bloggers help in increasing traffic so in order to do that ask a blogger to write an interesting content for your restaurant which you can publish on your website and later can share a link via social media. 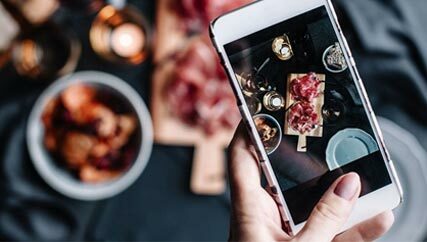 Inviting a blogger or a food influencer to dinner with the promise of an Instagram post or a short blog post might give you a good return as studied has shown that 81% US consumers trust advice and information from blogs and more than 60% have made a purchase based on a blog’s recommendation. Most Effective way: Where the influencer has the most engagement. Unique hashtags are those that you create. For example, a name for your restaurant or the name for a contest or promotion. Niche hashtags are those that already exist. That can be geographical, industry related or event-driven. Do a limit tagging. Images are the key to promote restaurants on social media. Today images get 94% more total views and are 40% more likely to be shard on social networks. People love to share the picture of whatever they do. You can upload images to your Facebook page, Instagram, Twitter, and Google+ here you can find a maximum number of people to connect with so post bright photographs of the dishes from your menu. This will make hungry scroller on Instagram and they might turn into your new customer. Visual images boost your audience engagement rates more than ‘text-only’ posts. So now you can put your photography skills to good use. To make your images look professional, you can use below-listed photo editing apps. Everyone likes free stuff. This is the best way to engage more customers by running a contest on social media channels. 79% people participant in social media contest and this is the best way to engage your followers and spread the word about your restaurant in a fun way. Every platform has a different set of rules so before you post any contest make sure you attach a statement saying that its no way sponsored, or associated with Instagram and also entrants confirm they are 13+years of age. Agree to Instagram’s term of use. Running a simple photo like take a picture with friends and a favorite meal at your restaurant. something new and take their suggestion to name the dish. They can even submit a recipe and a person who will win their recipe will be featured on your menu, offer giveaways to engage directly with your customers. For instance, you can declare offers on maximum check-in posts. They are quick wins for both the restaurant and the customers. You can post riddles, fill-in-the-blanks a caption contest. You have created an amazing brand with a unique concept. You attempt to give the best service to your guests. Share the same delight digitally. To be a social media friendly person by uploading photos, advertising your hashtags around your restaurant. Cover your basics if you want people to think about your restaurant on the first go. Follow and implement these social media posts to increase your customer engagement with your restaurant. Bottom line is that it’s all about people, and social platforms provide a direct line of communication with existing and potential customers. FILL THE BELOW FORM, IF YOU WANT US TO DO SOCIAL MEDIA MARKETING FOR YOUR RESTAURANT.